I've come to believe that the secret to true happiness lies somewhere farther away from an old pawnshop and maybe a little closer to a 4-minute spin on a tilt-a-whirl. Anyway, finding this John Prine biography to read was right up my alley. And this one is pretty good for what it is. The book takes the reader from John Prine's discovery in Chicago while delivering the neighborhood mail and walks us through each of his recordings from his amazing self-titled debut (1971) to "Standard Songs For Average People." (2007) Also from his struggle with the record company to his own successful "Oh Boy" record label. And his scary battle with cancer. 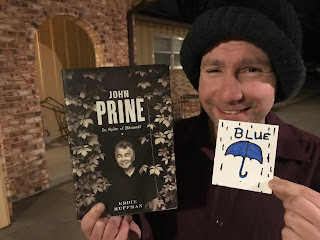 There are plenty of name-drops and funny Prine-isms and you will fall in love with John Prine if you haven't already. But what the book is sorely lacking is some actual deep one-on-one conversations with the man. Look I enjoyed Eddie Huffman's book offering. But what I hunger for is a true John Prine memoir where JP really opens the gate. I spoke with John Prine after he performed at the Wichita Orpheum back when I was in college. It was my first interview and it was short...but I'll never forget it. Here's John Prine.